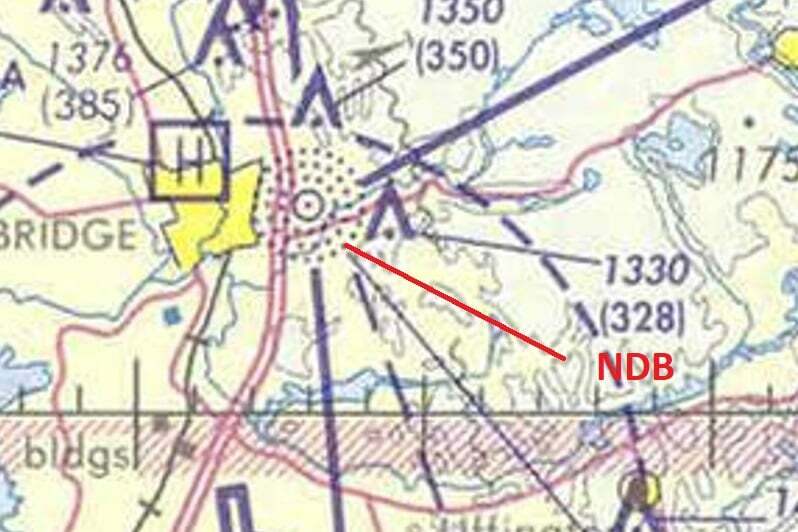 The ADF (Automatic Direction Finder) is the receiver of the NDB’s transmissions. 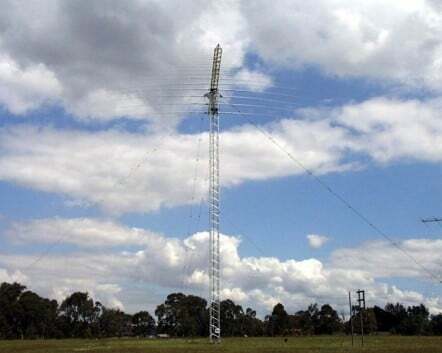 The NDB (Nondirectional Radio Beacon) is the transmitting antenna on the ground. Operates in the L/F, M/F range between 190 & 1750 KHZ. The angle between your heading and your heading to the station. Direction you want to track to the station. Shown by the indicator needle on the ADF. Direction your nose is pointed. Direction flown to the station in still air. RB + MH = (+/- 180 for FROM). Displays the bearing to the station relative to the nose of the aircraft. 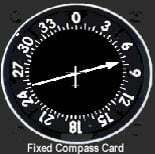 A fixed card bearing indicator always represents the nose of the aircraft as North and the tail as South (0° representing the nose of the airplane, and 180° representing the tail). 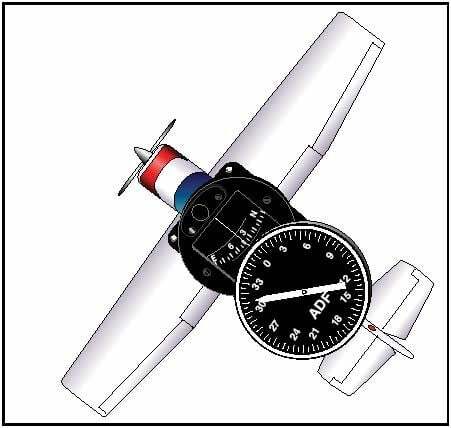 Some of the ADF dials can be rotated so as to align the azimuth with the airplane heading. Tune in the station (NDB) frequency. As with VOR’s and all radio navigation aids, it’s important to identify the station to ensure that you will be tracking relative to the correct NDB. In order to do this, the dial on the ADF must be turned to REC (receive). There will be a morse code identifier for each station. The identifier and the morse code can also be found on the map. Once you have turned in the NDB, it will point to the station (the selector knob must be on ADF). To test the ADF, press the test button (or with some ADF’s turn the dial to ANT) and the needle will rotate. Allow it to rotate 90° and release the button. When the button is released the needle should return to it’s original position (pointing to the station). This will ensure that the needle has free movement and that it is tracking properly. 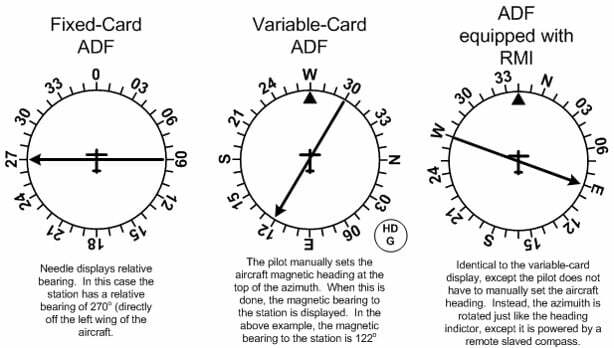 If in a no wind situation and the ADF needle is pointing to the top (0°), then your are tracking directly to the station and you have a relative bearing to the station of 0°. If the needle is not at the top (0°), and you want to track to the station you will have to establish what heading to take up to get the needle pointing to 0°. The needle give you the relative bearing (the angle between your heading and your heading to the station), and your heading indicator will give you your magnetic heading. 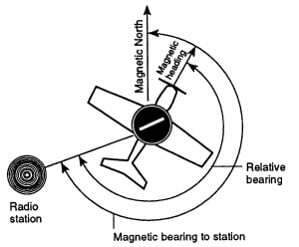 If you add magnetic heading to your relative bearing your will get the magnetic bearing to the station. (The magnetic heading you will have to take up to get the needle pointing to the top- 0°). MH + RB = MB to the station (NDB). Your Relative Bearing (RB) is 050° (ADF needle is pointing to 050°). 040° (MH) + 050° (RB) = 090° (MB). 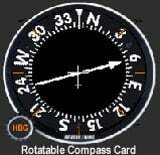 If there is a wind and you take up a heading of 90° tracking to the station, your needle will start off at 0° but as you get drifted off, your needle will continue to point to the station and, therefore, the needle will also be drifting off. In order to compensate, you must crab into the wind to maintain your desired track to the station. 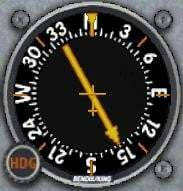 Because the nose of your aircraft will not longer be pointing directly to the station, the needle will no longer be right at 0°. When heading increases (right) ADF needle decreases (left). Turn until the relative bearing is 000 degrees. Note wind drift by bearing change. Wait until on track and decrease drift correction by 1/2. If you needle has been moving to the left you need to crab to the left because your airplane has drifted to the right. If you needle has been moving to the right you need to crab to the right because your airplane has drifted to the left. 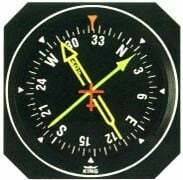 Wind corrections are made similar to tracking to the station, but the ADF needle points toward the tail of the airplane or the 180° position on the azimuth dial. 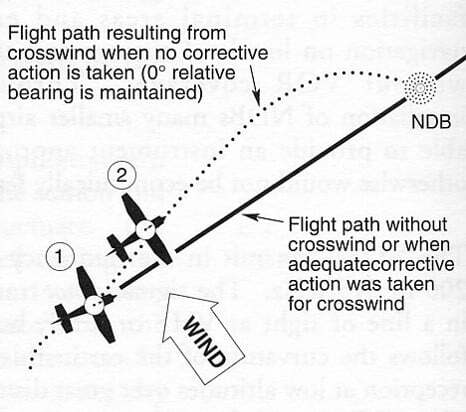 Attempting to keep the ADF needle on the 180° position during winds results in the airplane flying a curved flight leading further and further from the desired track. To correct for wind when tracking outbound, correction should be made in the direction opposite of that in which the needle is pointing. Determine your position in relation to the station. Note whether the station is to the right or left of the nose position. Determine the number of degrees of needle deflection from the zero position, and double this amount for the interception angle. Turn to the desired MB the number of degrees determined for the interception angle. Maintain the interception heading until the needle is deflected the same number of degrees from the zero position as the angle of interception (minus lead appropriate to the rate of bearing change). Turn inbound and continue with tracking procedures. 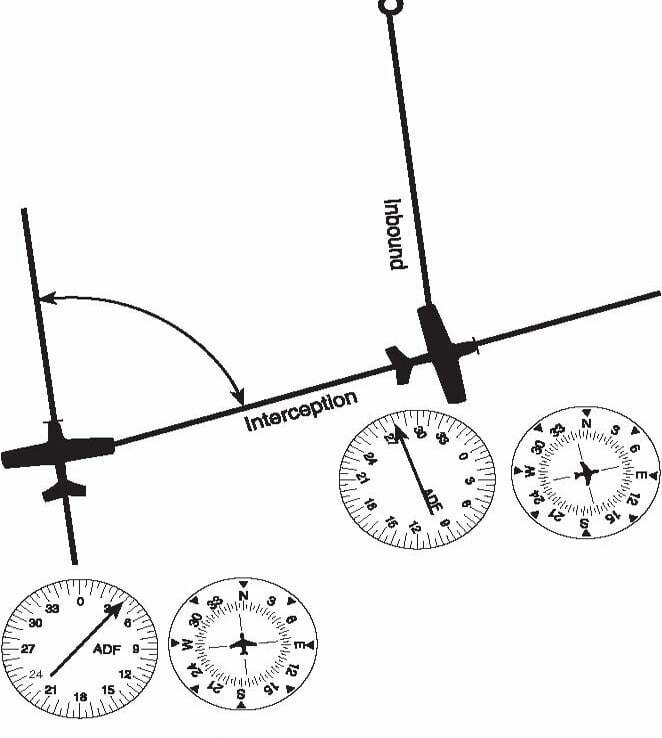 If the needle is pointing in front of your intercept angle, you have not reached the bearing to be intercepted. If it points behind the intercept position, you have passed your bearing. Interception of an outbound MB can be accomplished by the same procedures as for the inbound intercept, except that it is necessary to substitute the 180°position for the zero position on the needle. As the aircraft gets close to, over, and then past a beacon, the ADF needle may swing back and forth in any direction then eventually settle to a 180° position. 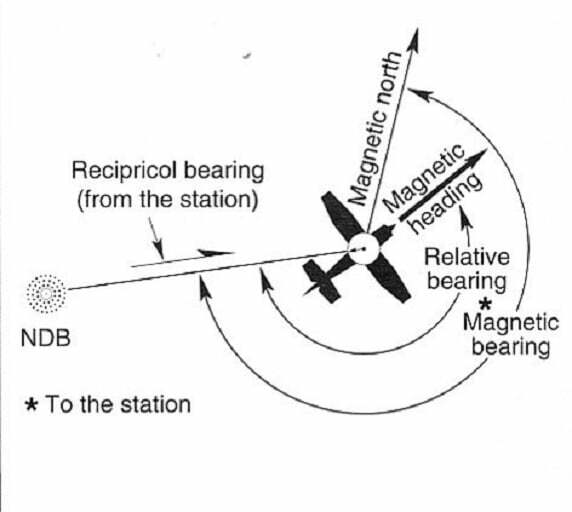 Passage of the station is when the needle rotates and give a deflection of 180° (indicating that the station is now directly behind you). Note the bearing to the station and the time. Fly a constant heading until the bearing changes 10°. Note the number of seconds it takes for the bearing to change this 10°. Then simply divide that elapsed time by ten to determine the time to station in minutes. Minute to station = Time in seconds / Degrees of bearing change. 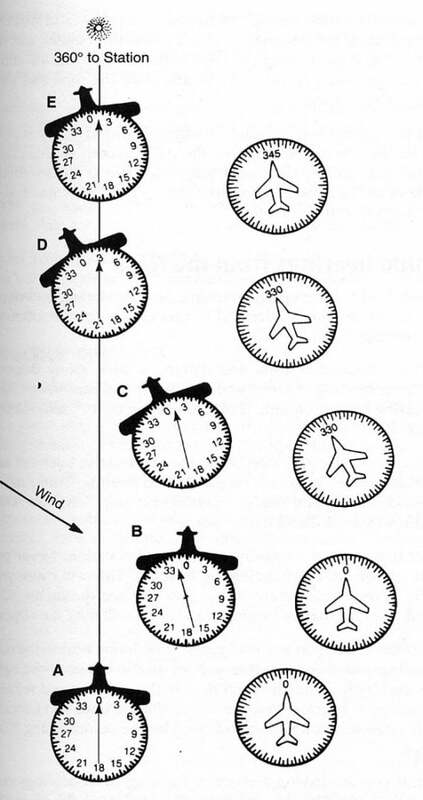 Nautical Miles to the station = TAS (kt) x Minutes flown / Degrees of bearing change. What is the basic information given by ADF ? What should be indicate at the top of a manually rotatable card indicator ? What happens during station Passage? What intercept angle do you use when tracking inbound to a station?